Poverty is not our destiny. India should have been a rich, developed nation by now but it is not. We, the people of India, have the important duty to make India prosperous. Indians are quite capable of creating wealth, as they have demonstrated in every part of the world they have migrated to. The primary reason for the failure to produce wealth in India is incompetent governance, myopic leadership, and bad policies. It is time we — all of us — took up the challenge and changed India’s direction with a new model of governance and politics. I am a technology entrepreneur and a pioneer in Asia’s dotcom revolution. After creating India’s first Internet portals in the late 1990s, I started what is today India’s largest digital marketing company. My journey as an entrepreneur continues, but now in a different domain – nation building. ​I strongly believe that India needs transformation and we must be the entrepreneurs in that revolution. 1. Why is India still poor? 2. How has India’s government kept India poor? 3. Why has changing rulers not changed outcomes? 4. Why are other nations richer? 5. How will Nayi Disha make Indians prosperous? The simple truth is governments do not create prosperity; people do. At best the government provides the enabling environment for people to create wealth; and at worst the government actively prevents the creation of wealth by needlessly handicapping the people through bureaucratic red-tape, corruption and high taxes. The ‘license permit quota control raj’ of Indian governments has doomed India to poverty, just like the British government did before independence. Indians lack freedom. Individuals are discriminated based on caste, religion and group affiliations. The government needlessly interferes and engages in economic and social activities. Decision-making in government is too centralised and removed from its people. Justice is delayed. Public wealth is controlled, abused and misused by the government. It is not surprising then that Indians continue to stay poor. The numbers tell a sad story. 92% of Indian households have a net worth of less than ₹6.5 lakh. The median Indian household has an annual income of just ₹1.2 lakh, or about ₹10,000 per month. In the IMF’s per capita GDP rankings, India is 126 out of 200 countries. Over 30 crore Indians – the entire population of India at independence – still live in extreme poverty. Half of India’s 5th standard students cannot read at 2nd standard level. In a country with nearly 30 crore youth in their 20s, job creation is almost at a standstill. The 60 crore Indian middle class lives on just ₹130 - ₹650 a day. 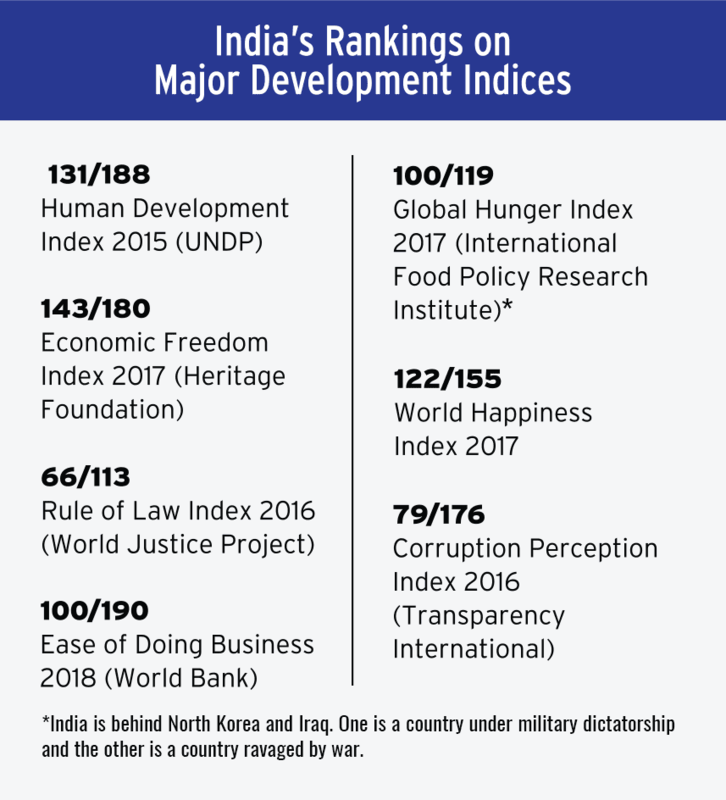 On every index from human development to doing business, India performs poorly. The root cause is the same in all cases – deep and flawed government interventions. This lack of prosperity has been deliberately engineered and perpetuated through decades of bad policies by successive governments. The inability to monetise their limited assets and inaccessibility of credit has trapped the poor into poverty. High taxation takes a significant chunk of what people earn and spend. People are treated unequally. They get privileges based on their group affiliations — religious, caste, etc. Certain groups are taxed and the proceeds are used for buying the affiliation of other groups. People also face discrimination in getting jobs and public assistance. 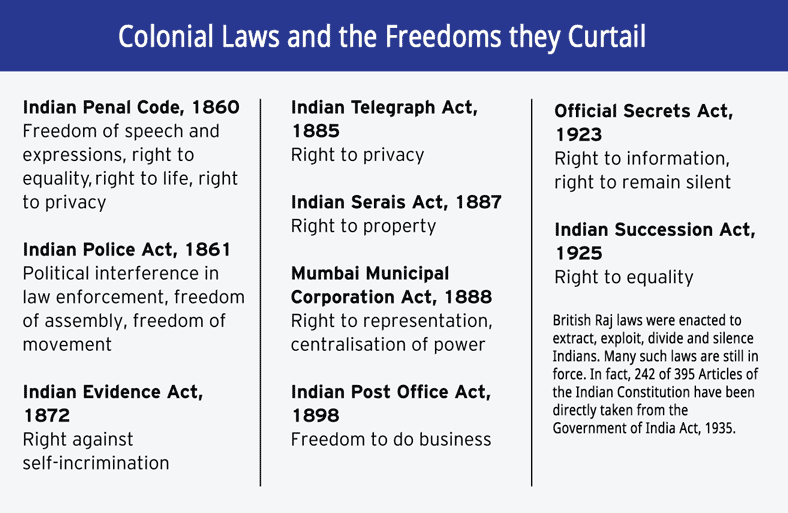 British Raj laws that severely limited individual and economic freedom of Indians are still in effect with barely any change. Private property is not a fundamental right — it is only a constitutional right subject to political whim. British Raj laws were enacted to extract, exploit, divide and silence Indians. Many such laws are still in force. In fact, 242 of 395 Articles of the Indian Constitution have been directly taken from the Government of India Act, 1935. Over the past 70 years, government has repeatedly intervened in the economy, almost always to the detriment of people’s well-being. It is engaged in hundreds of businesses, most of them losing money and therefore having to be constantly bailed out at the expense of taxpayers. It is involved in airlines, railways, power generation, oil and natural gas, heavy machinery, telecommunications, education, and so on. These public sector units also control large swathes of prime land across the country. Land and other assets are seriously under-utilised or totally unproductive. Every Indian family has been forced to pay ₹4,000 towards the losses for just these five companies. 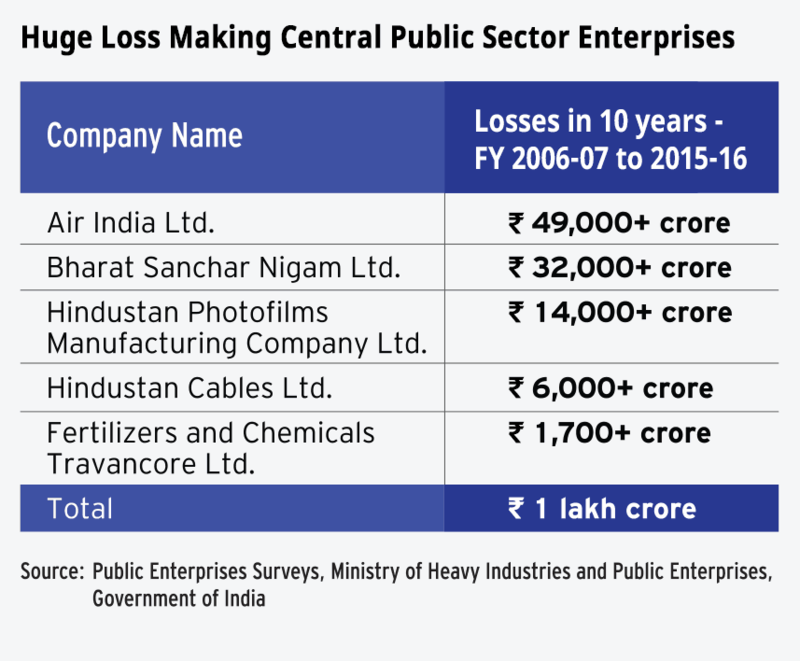 There are hundreds of other central and state government entities which lose money on a regular basis. The intrusion of government into areas where it does not belong harms national interest. It is a ‘maximal government’. 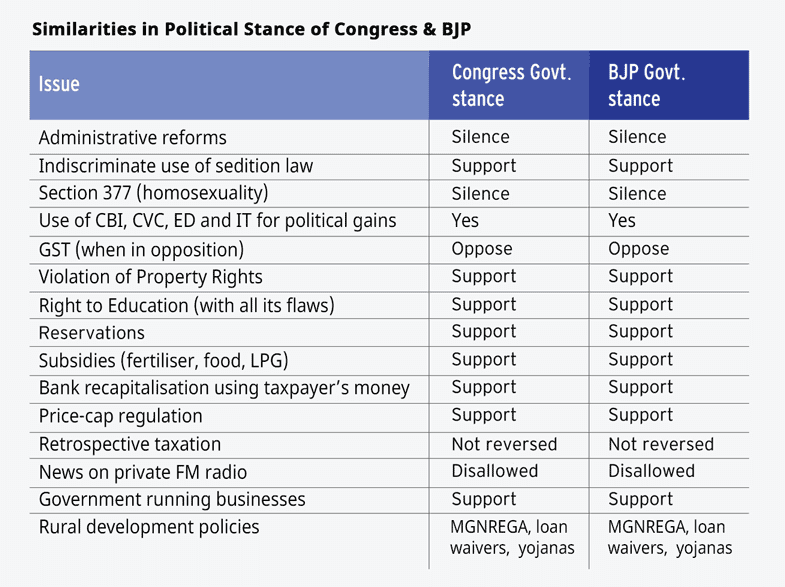 For Indians to prosper, India has to move away from maximal government to minimal government. The political parties and leaders in power have little or no incentive to change India’s direction,and thus have kept India on the same path of extraction and exploitation as the colonial rulers. Their sole purpose has been to stay in power, for which they have kept Indians poor and dependent on government handouts in return for votes. The prosperity of Indians is not their objective. Consequently, economic policy has been remarkably consistent across all governments and political parties – laden with pro-poor rhetoric without actually benefiting the poor. Messaging during elections – and therefore voting – is based on surname, caste, quotas, subsidies and doctored history. Prosperity is promised but never achieved because the policies almost always take Indians in the opposite direction. Politicians and bureaucrats have become rich, even as most Indians have remained poor. India’s rulers have changed, but the rules have not. And without changing the rules, outcomes will not change. Change does take time, but one needs to stop going in the wrong direction and start moving in the right direction. In India’s 130 crore population are 130 crore futures waiting to be set free. Who knows how many great scientists, poets, social reformers, inventors and sports champions India has to give to the world — only if they had the opportunity to flourish. That cannot happen if they are trapped in poverty. The world today is fabulously rich compared to the world of the year 1750 when most of the world was poor. The wealth of the modern world is due to a new set of ideas — known as the Enlightenment — which led to the Industrial Revolution in the Western nations and made them rich. Indians have been kept poor even as other countries like Singapore, South Korea and China have put their citizens on the fast-track to prosperity in the past few decades. 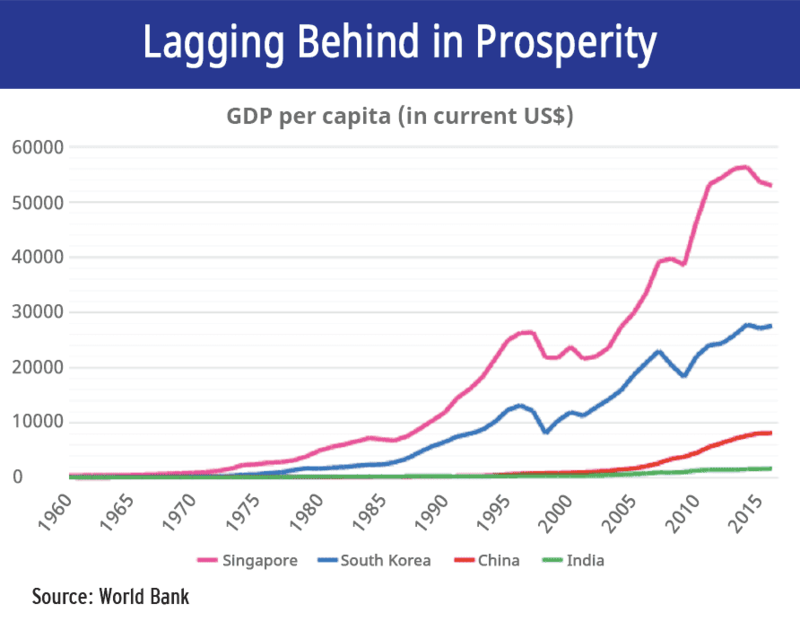 India has lagged significantly behind its Asian peers in creating prosperity for its people. The question we should be asking of our government: Why are we not 10 times richer? People create wealth when they have the freedom to produce what they are capable of and trade in free markets. But Indian government policies coerce people and deny them economic freedom, thus ensuring poverty. Only those nations which enjoyed the benefits of free trade, and in which individual rights were protected by law became wealthy. If Indians have to become prosperous, India must become free. For India to become free, Indians must demand freedom from government control. This is Nayi Disha’s objective. Nayi Disha is a platform to bring together Indians who wish to make India prosperous. The core objective is to unite citizens on an agenda of freedom, equality and wealth creation. Nayi Disha’s 5 Prosperity Principles and 5 Starting Solutions will usher in a new model for governance and politics in India. India, like every successful entity, must have a set of principles at its core from which all governance and policies are derived. These principles must be understood by its citizens and therefore must be comprehensible and minimal. 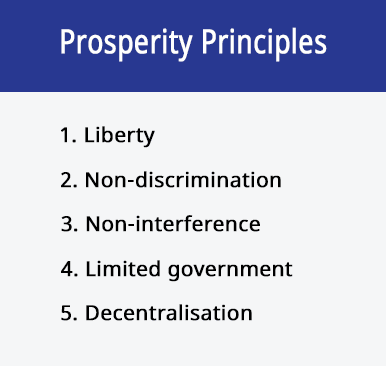 Nayi Disha’s Prosperity Principles are based on the precept 'that government is best which governs the least'. They will help India become a liberal society with the individual as the principal and the government as the agent. All policies must be based on these principles. 1. Liberty: The government cannot abridge any freedom that citizens have as their birthright. Citizens must be guaranteed freedom of speech and expression, and right to property. The government should provide a level playing field for all people to be free to do whatever they wish to do and ensure that no person encroaches on the rights of other individuals. 2. Non-discrimination: The government is prohibited from discriminating among citizens. No special status should be granted for any individual or group based on their religious, caste, or linguistic background. 3. Non-interference: The government must not interfere in voluntary exchanges among citizens. The role of the government is to ensure equality of opportunity and not force equality of outcome. 4. Limited government: The government must not engage in business and commercial activities. The government should be a referee and not a player. Government should be involved only in the basic duties such as providing public goods that cannot be efficiently provided by the private sector. 5. Decentralisation: Under the subsidiarity principle, governance matters should be handled by the competent authority closest to the people, rather than by a central authority. The public wealth of India (comprising land, minerals and other resources, and government-owned corporations) is estimated by Nayi Disha to be in excess of $20 trillion. This comes to a minimum of ₹50 lakh for every Indian family. Nayi Disha’s two key solutions – returning ₹1 lakh per year per family and capping taxes at 10% – aggregate to an annual benefit of about ₹1.5 lakh for every household. Besides putting more money in the hands of people, these initiatives will also create a safety net for every Indian family, eliminate poverty, scale up job creation, reverse the growth of government and empower Indians to create wealth. This will boost private investment and economic growth, making additional resources available for public infrastructure and growing state capacity in the areas that it is currently deficient. 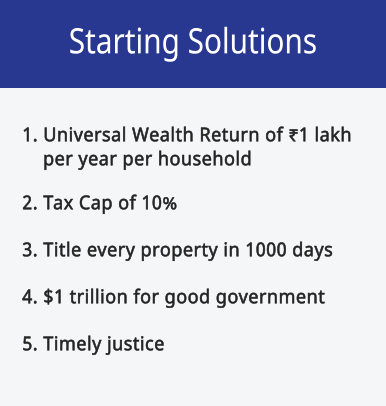 Nayi Disha’s other three solutions are about ensuring good governance – by titling every property in the country and thus ensuring that people can unlick their private wealth, investing in the core activities of government, and ensuring timely justice. This is the share of every Indian family in the public wealth of India which they own but which the government currently controls. This distribution of public wealth in instalments will empower them to create wealth for themselves – to get skilled, start businesses, buy tools, build assets, move to a city, etc. It will also give them the financial ability to withstand sudden income shocks. People know what they need better than any government official, and people can spend their own money more productively. You can read about our Dhan Vapasi ideas here. A technology entrepreneur and a pioneer in Asia’s dotcom revolution, Rajesh created India’s first Internet portals in the late 1990s. He then started what is today India’s largest digital marketing company. Rajesh continues to be an entrepreneur but in a different domain – nation building.